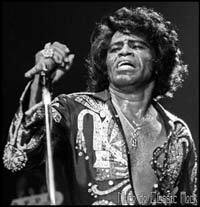 James Brown, a unique and superb musician as well as a social activist, started out in life in extreme poverty. Born in 1933 in Barnwell in little more than a shack, his parents separated and by the age of four Brown had been sent to Georgia to live with an aunt. Brown grew up in the midst of the Great Depression, his aunt being the madam of a brothel. As soon as he was able to earn money for himself, he threw himself into any work he could think of including shoe shining and car washing. He recalled earning just a few cents shining shoes, and remembers poverty being so bad for his family that he was almost nine years of age when he first wore briefs bought from a regular store. James Brown’s childhood made him even the more determined to excel and make a success of himself, starting full time work at the age of 12 when he was expelled from school for “insufficient clothing.” Brown turned to religion in this tough time, singing in the church choir. He however turned to crime in his teens and was sentenced to a three year prison term at the age of 16 for stealing a car. Once again though, Brown made the very best of what he had, and formed a gospel choir in prison and formed a firm friendship with R&B singer Bobby Byrd. After turning his attention to athletics and boxing on his release, two years later in 1955 Byrd invited him to join his vocal group. The group became the Famous Flames, and Brown quickly dominated the group with his talent and they were offered a record contract; shortly after the hit single “Please, Please, Please” followed. As well being a singer, dancer, and superstar, Brown made time to dedicate to causes close to his heart. In the 1960’s he campaigned to the black community to finish their education, writing the song “Don’t Be a Drop Out,” in 1966. It is evident within his song writing that his early childhood had had a profound effect on him, but one that he would put to use in the most positive of ways. He staged many non-violent protests and on the assassination of Martin Luther King Jr. he staged a life concert in Boston in an attempt to stop rioting spreading across the troubled nation. After several hits in the 1970’s, Brown slid into a life of drugs and depression in the 1980’s, his decline starting after being initiated into the Rock and Roll Hall of Fame. His troubles came to a head in a police car chase in 1988, and Brown was jailed for 15 months after raising a shot gun at a seminar. Brown’s personal life was also rather troubled, having married four times and fathering six children before dying in 2006 at age 73.